Toyota has confirmed that it is pulling out of Formula 1 racing after posting its worst financial loss. The world's largest car manufacturer will concentrate on its core business. Toyota president Akio Toyoda said the Japanese team had no option but to pull out citing "the current severe economic realities" affecting the world. The team failed to win any of the 139 races it entered after making its F1 debut in 2002 but was fifth in the 2009 constructors' championship. Toyota's withdrawal leaves the sport with no Japanese team after Honda left F1 at the start of the 2009 season. They become the third manufacturer to quit the sport in the last 11 months after BMW announced it was leaving in July. Honda were replaced by Brawn, who went on to win this year's drivers' championship with Jenson Button and the constructors' championship. Button told BBC Sport: "It's sad. I thought Toyota would continue. "They've obviously got their reasons, as Honda did, but it's a pity for F1 and for Toyota. Hopefully we can survive without them." In May the company revealed its worst set of figures for the last financial year - a 436.9bn yen (£2.9bn) loss in the year to 31 March, 2009 and is expecting further losses when it posts its results to September 2009 on Thursday. "It was a tough decision because we are betraying the expectations of fans," Toyoda, a racing enthusiast and grandson of Toyota's founder, added. "I apologise to our fans from the bottom of my heart. I made the decision myself." 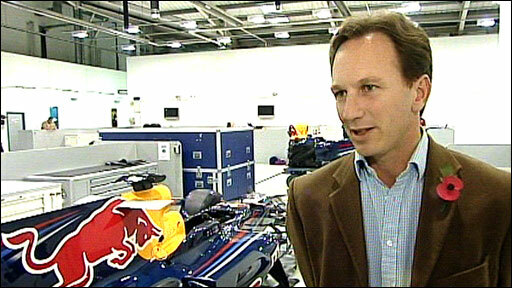 He also ruled out supplying engines to other teams, saying: "In terms of Formula 1, we will make a complete withdrawal." Williams announced last month that it would be replacing its Toyota engine with a Cosworth for next season. F1 governing body the FIA issued a statement in which they revealed their concern at the withdrawals of Toyota and tyre firm Bridgestone. 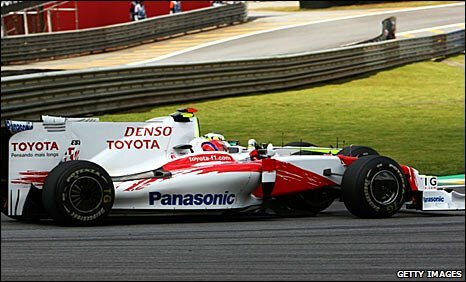 "Toyota's decision comes just weeks after its F1 team signed the new Concorde Agreement until 2012," the statement read. "Urgent clarification is now being sought from the Toyota F1 team as to its legal position in relation to the championship. This will have a direct bearing on the admission of any future 13th entry. "The FIA has repeatedly warned that motor sport cannot outpace the world economic crisis. That is why the competing teams have been asked to cut costs and the entry of independent teams has been encouraged. "The FIA accepted the cost-reduction measures put forward by the teams on the basis that they would ensure a long-term commitment to the championship. "Toyota's announcement demonstrates the importance of the original cost-reduction measures set out by the FIA. "The FIA will now work to ensure that Toyota's departure is managed in the best interests of the championship and will continue to encourage the F1 teams to undertake the necessary cost-cutting measures for the good of the sport." Former team owner and BBC pundit Eddie Jordan told BBC Sport: "I'm really disappointed that Toyota have decided to pull out. "When fellow Honda withdrew last December the team continued as Brawn Grand Prix and the rest is history. "I hope Toyota will leave the sport with the same dignity and allow the team to continue in a new guise. "Toyota signed a new Concorde Agreement in the summer committing them to F1 until 2012 and so it could be possible for the team to continue in another form if the rest of the grid allow it." The Formula One Teams Association issued a statement praising Toyota's "significant contribution to the success of Formula One for the past eight seasons. "We hope very much that Toyota will return to the world's most technologically-advanced racing competition in the not too distant future." Cologne-based Toyota F1's demise could pave the way for Sauber to return, after Swiss-based Qadbak Investments stepped in in September following BMW's withdrawal from the BMW Sauber team. At the time, the FIA gave Sauber "14th place" for next season, meaning they were first reserve to fill any vacancy. 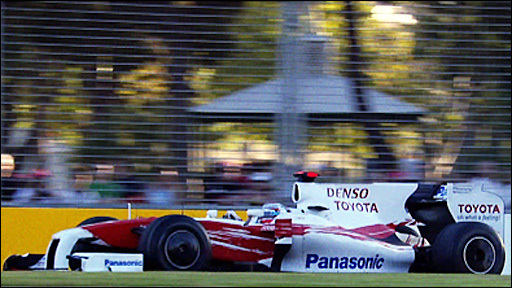 Toyota's season promised much after long-term driver Jarno Trulli finished third in the opening race of the season in Australia and followed that with another third in Bahrain, after starting race four from pole position. His team-mate Timo Glock also stood on the podium after finishing third in the rain-affected second race of the season in Malaysia. But neither driver would reach the podium again until race 14 when Glock finished second behind Britain's Lewis Hamilton in Singapore, equalling the team's best finish to a race. One week later, in early October, Trulli also came second at the Japanese grand prix at Suzuka. Japanese driver Kamui Kobayashi joined Trulli, who finished the season eighth in the standings, for the final two races of the season after Glock, who came 10th, was injured. Trulli is tipped to join Lotus while Glock is expected to move to Renault later this week but Kobayashi's future is less clear. Germany's Ralf Schumacher, France's Olivier Panis and Britain's Allan McNish have also all driven for Toyota over the years. In July Toyota pulled out of hosting the Japanese Grand Prix at its home Fuji Speedway circuit from next year. Fellow Japanese companies Subaru and Suzuki withdrew from the World Rally Championship prior to this season while Kawasaki pulled out of MotoGP.